Fiction. Art. Jewish Studies. THE WHITE CRUCIFIXION starts with Chagall's difficult birth in Vitebsk 1887, in the present-day Belarus, and tells the unlikely story of how the eldest son of a herring schlepper became enrolled in art school where he quickly gained a reputation as "Moyshe, the painting wonder." The novel paints an authentic picture of a Russian town divided by belief and wealth, rumours of pogroms never far away, yet bustling with talented young artists. In 1913, Chagall relished the opportunity to move to Paris to take up residence in the artist colony The Hive (La Ruche). The Yiddish-speaking artists (Ecole Juive) living there were all poor. The Hive had no electric light, or running water and yet many of its artists were to become famous, among them Amedeo Modigliani and Osip Zadkine. The novel vividly portrays the dynamics of an artist colony, its pettiness, friendships and the constant battle to find the peace and quiet to work. In 1914 Chagall and Bella make what's supposed to be a fleeting visit to his beloved Vitebsk, only to get trapped there by the outbreak of the first world war, the subsequent Russian revolution, and the establishment of the communist regime which is increasingly hostile towards artists like Chagall. Yet, Chagall keeps on painting, and the novel provides a fascinating account of what inspired some of his greatest painting. He manages to return to France and is reunited with his paintings only to be thwarted by yet another world war which proves disastrous for the people he knew in Vitebsk which include his uncle Neuch, the original "Fiddler On The Roof." 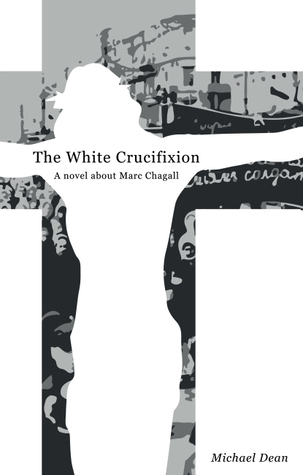 THE WHITE CRUCIFIXION is a fictionalised account of the rollercoaster life of one of the most enigmatic artists of the twentieth century. Wow! What a wonderful story - a fictionalized account of one of the greatest artists, Marc Chagall. We learn about his birth, his upbringing, his art, his love, his passion, etc.. Talk about an exciting life! I loved getting to know Chagall through this book - learning about the personal so that we could better understand his passion. Michael Dean has written a beautiful novel chock full of emotion, history, and creativity - I loved it! The White Crucifixion details different moments in Chagall's life as he grew and expanded into his artwork. We learn about the ways in which war and his country inspired his paintings. We read about the ups and downs he experienced throughout his life. And we find a man who paints, paints, paints the world around him. Its mesmerizing to read about Chagall's life - I found myself looking up his paintings as I read this book. I was captivated by the colors, images, history that flowed through his creations. What a rich reading experience! I would happily recommend this novel to fans of Chagall and anyone looking for their next great read - you will LOVE this book! Thank you to Holland Park Press for providing me with a copy of this book! Great review. I love novels about the life of artists. Adding to tbr! You know how I love books about art and artists! I'm definitely adding this one to my list. Someone else recommended Lisette's List to me not too long ago and said that Chagall, or some of his paintings, was in that book, too. Have you read it? I think it's by Vreeland. Lark, yes! I thought you might like this one :) I haven't read that one, so of course now I have to - thanks for the heads up! Hope you enjoy this one!